RYAN: I love documentaries. And they’re the best when they’re both entertaining and enlightening or educational. This is one of those docs. And it’s a bit maddening too because it’s about real issues and how easily manipulated we are as consumers, as the general public and the like. CAROLINE: Yes some documentaries can really be insightful and almost like a call to action or a wakeup call for certain issues. This one sounds really interesting. How was it? RYAN: Fantastic. It’s very well laid out as a cohesive film, with important information coming out you, without beating you on the head with it. And the graphics are all really inspired. 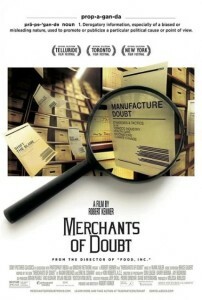 The movie draws a parallel between magicians using slight of hand tricks with the political or business talking heads who misinform us on behalf of greedy companies. CAROLINE: That’s both scary and pathetic all at once. RYAN: It’s maddening. 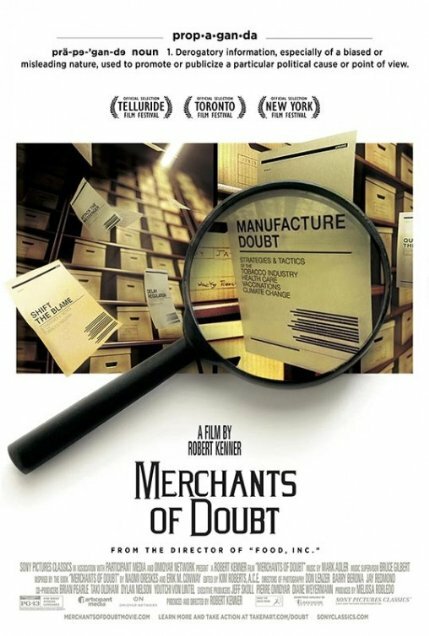 The film uses what the tobacco industry did in burying their evil truths as an example for how other industries are currently knowingly deceiving the public. RYAN: So then the film dissects furniture that is flame retardant, global warming, etc… basically the world is going to end and we’re not doing anything about it. CAROLINE: (laughs) Well some of us are. RYAN: It all comes down to the reality that government needs to get involved in order to make a real difference but many people are not comfortable with the concept of government intervening in business. CAROLINE: And this movie focuses on the people who are knowingly lying to the public? RYAN: Yes. And some of them are proud of it. It’s sick. Think about catastrophe movies. We’re talking about the end of the human race – what higher stakes are there? And yet the world drags its feet in making a change that could save us. CAROLINE: It sounds so dramatic but I see your point and ultimately, wouldn’t we all rather be safe than sorry – of course, the businesses who would lose money wouldn’t. RYAN: The people who deny factual evidence, it’s like you’re watching The Twilight Zone. CAROLINE: I’d rather watch Twilight. RYAN: I was so moved by this film, I totally signed the petition at TakePart.com and urge you to as well. And check out the movie! It’s engaging but the reality is scary. I’m not a fan of documentories but I’ll give this one a shot.